In my own words: Pinterest Bonus round! My friend Kelly showed me this on her pinterest and I linked it immediately because I HAD TO HAVE IT. I wanted it in the playroom I'm creating for Logan, stat. I used the advice from Unsimple Living and grabbed a box of 64 crayons plus a box of 24 crayons so I could sub out the blacks, grays, and browns. I wanted this art to be all bright colors baby! I wasn't sure what size canvas to buy so I got one that was 24" by 30". For that size I would recommend buying more crayons than what I had. Mine didn't end up going as close to the edge of the canvas as I wanted but I was ready to craft so minor details like not enough supplies wasn't going to stop me. I started by laying out the crayons in the order I wanted them, and then hot glued them with high heat across the canvas. Um, can you guess what brand I used? I did this during craft day and although this was the easy part we were holding our breath like I was performing brain surgery. After I got them glued down I set the canvas outside in the sun to try and soften the crayons a little bit. Once they started to sweat I got my blow drier out and used the lowest speed with the hottest temperature to melt the crayons. I could not even believe how fast it started to work. Within seconds the crayon started to drip down the canvas. Wahoo! I would have started dancing if I didn't need to keep melting crayons. Once the melting began it went fast. Wax was pouring out of some of these paper tubes. Don't you love these colors? I love them! Love the colors! Love the blow drier! Love the world!!! It was around here that I had the unfortunate incident of bumping the melted wax with the end of the blow drier. CURSES! Thank goodness all it took to fix that little dent was 2 more seconds of hot air. But then that blob of pinky/purple crayon dripped off the end of my blow drier into the green area. AND JUST WHEN THINGS WERE GOING SO WELL. Always quit while you're ahead, friends. Just do it. So I hoped for the best and scraped off the suicidal crayon then painted over the mark it left with a bit of white paint. You can't even tell, can you? Rah Rah sis-boom-bah. I'm not even sure why I loved this project so much (other than that it's awesome) but I do. I totally have plans to make a couple smaller melty crayon canvases so I can have a collection on the wall. And I'll need frames for them all. And of course I'll need to actually hang them. Why is that always the hardest part? This room is gonna be so awesome when I'm done that I'm not even gonna let Logan play in it. It will be a shrine to me and my craftiness. The skinny: Well, if you haven't figured it out yet I loved this project. If you do it be sure to have your blow drier on its lowest setting otherwise the crayon will splatter. Unless that's the look you're going for of course. 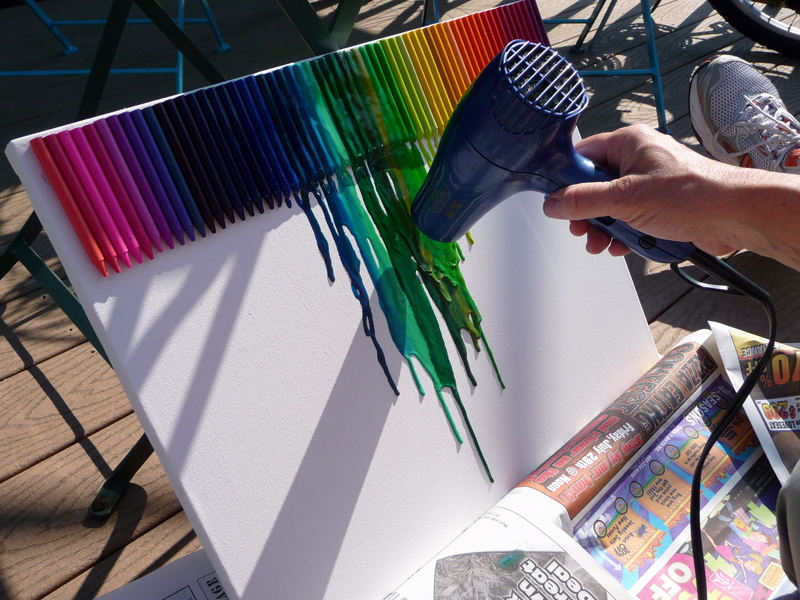 This is also another great way to get inexpensive wall art. I think the whole thing cost me about $17. Yay!! A new blog friend! Really cute picture for your playroom. I love your craftiness! I hope you'll keep doing at least a little of this every week. I feel like I get to live vicariously through you as a non-crafting person; which I have come to accept is really the only kind I will ever be. But it's fun to see and I love to see your passion! Now I have to get me a play room! I kept waiting for the "double mother trucker!" to the crayon blob, but you cant even see it. love this one. I am totally going to do it someday. Lots of color coordination possibilities. Like that you left the wrappers on.